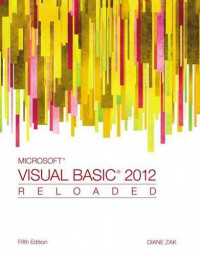 Pairing fundamental programming concepts with business applications and also fun and engaging game applications, MICROSOFT VISUAL BASIC 2012: RELOADED, 5E provides a solid foundation in programming principles and how to use them. The book begins by covering the basics, like creating user interfaces, and understanding variables, constants, and calculations. Building upon this knowledge, coverage progresses to more advanced topics like creating classes and objects and using ADO.NET, LINQ, and ASP.NET. This edition leverages the powerful pedagogy of previous editions, but brings it up-to-date with Visual Basic 2010 and new examples and applications.